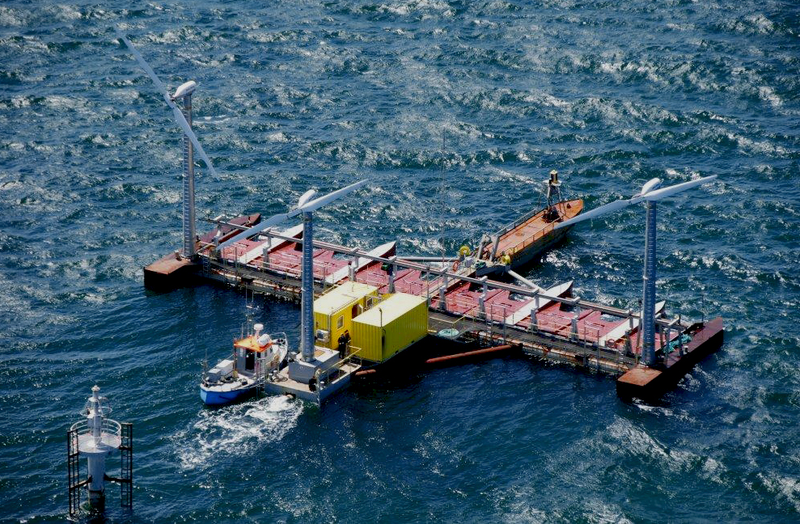 A floating foundation which works as a platform for extracting energy from both wind and wave power. Poseidon is a concept for a floating power plant that transforms wave energy into electricity. The power plant furthermore serves as a floating foundation for off-shore windmills, thus creating a sustainable energy hybrid. The demonstration plant named Poseidon 37 is 37 meters wide, 25 meters long, 6 meters high (to deck) and weighs approximately 350 tons. Floating device in the Baltic Sea, near Lolland, Denmark. Poseidon went into real sea test in 2008 off the shores of Lolland in southern Denmark and has completed 4 grid connected tests, the last one ending in 2013. The test site was grid connected with both a 690V and a 10 KV connection. The electrical infrastructure was installed in corporation with DONG energy. In parallel with these testing activities the technology is currently (with a large group of partners) being scale up and engineered for the first full scale commercial unit. A P80 (a 80 meter wide construction including 5-8MW wind turbine and 2-3,6 MW wave. This facility will be installed in the UK together with DP energy. Two separate project companies have been established in the UK, one in Wales and one in Scotland. P37 has secured a 7 year test license at the Vindeby test site, including infrastructure and PPA. DONG Energy environmental department has been a great help in this process. The project has according to Danish law been in hearing and approved with the necessary documentation. The platform has been placed in closed connection with an already existing off-shore wind turbine park in a non sensitive area, in all regards except for birds. The area is in/close to a shallow water sensitive bird habitat. Since no similar platform has never been launched FPP has to a high degree used already published EIA information from off-shore wind turbine parks, barges and similar. To address the issue of the birds FPP has chosen to monitor and count impacts and how the birds interact with the platform (for resting, etc.). Poseidon Floating Power (Poseidon 37) is located in Denmark. Simple baseline study of sea bottom before installation. Before, under and after each test phase this is updated. No erosion impact. No significant growth impact. No large vertebrates present. Data from similar placed wind turbine and other tidal/wave project are used in the scaling up. FPP has chosen to divide it off-shore sea trials into 4 test periods. One of the reasons for this is to continue to be able to learn and develop our technology but also to be able to develop and focus our environmental data acquisition. During the next test phases this will be increased and focused even further. This information is crucial in the design and up-scaling process, to secure minimum impact. Documentation in correlation with the application and approvals for p37 can be supplied upon request, but please note all documents and documentation is in Danish. No specific studies except the above video and evaluation of the device when in harbour. FPP is together with Jotun coatings testing a large variation of environmental friendly anti corrosion and anti-fouling systems. Study of the platform between each test. Growth of local species can be significant if not protected. The testing area is placed in a no fishing zone and the area in general is not a commercial fishing area. So no formal impact studies have been implemented during the first two test phases. Because of the large wave absorption a shelter area is created. Some fish grass and take shelter here. 1. FPP has a program for counting bird impacts. 2. The platform and supporting areas is video monitored and taped. 3. FPP has entered into FOA with NMREC concerning the development of advanced bats and birds monitoring and impact systems. 1. No impacts have been registered. 2. For some reason the birds present or migrating do not use the platform resting, eating of fishing (in the still water). Several hypotheses are being evaluated for this. No key effect, FPP has a continuous dialogue with other local users and is used to attract more tourist. We supply tours when testing. Studies of the cable installation, video and surface studies before and after. No official FPP EIAs have been released, but FPP are in continues dialog with the Danish Energy agency (which is coordination environmental body) and Dong Energy environmental department. Besides the more general known studies of wave energy devices and their impact, we have attached the most used papers/studies by FPP – most of them concerning wind and birds.